Umbrella strollers are one of the greatest accessories you can buy for you and your child. They help to keep the rain and sun off of your child no matter the weather. And a great travel umbrella stroller can go anywhere you go! We have researched and reviewed all of the highest-rated travel umbrella strollers that we could find, dissecting each one until we came up with a list of our favorites. All ten top umbrella strollers on this list are awesome, and we can’t wait to tell you all about them. Here is a list of some of the most important things we looked at while shopping. 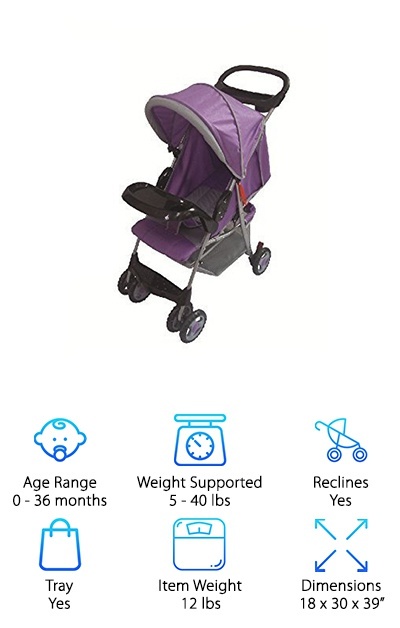 Age Range - What age range is this umbrella stroller good for? We’ll give you a range of ages, in months, so you know if this one is right for your child. Weight Supported - How many pounds can this chair support? Make sure your child will be safe and supported in a travel umbrella chair made for their weight. Reclines - Does this chair recline? 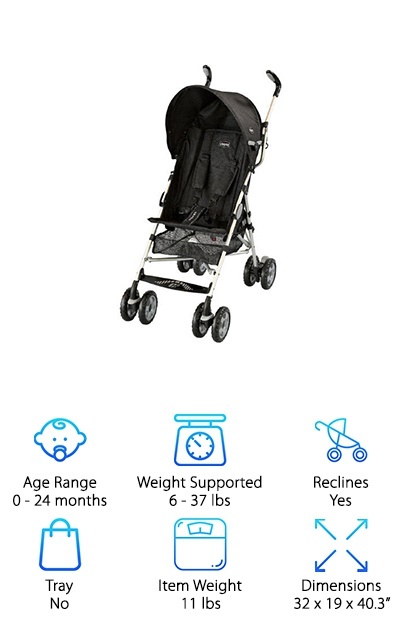 If you’re looking for a travel stroller that can also work as a portable place to nap, check this icon out. Tray - Does this umbrella stroller have a tray? Trays are great for snacks, games, or toys, so we’ll let you know if it comes with one. Item Weight - How many pounds does it weigh? You’ll have to be able to pick it up and move it while using it, so makes sure it’s not too heavy. Dimensions - How big is it? We’ll let you know, in inches, so you can make sure it will fit in your car, on a plane, or wherever else you want to go. Ready for the best reclining umbrella stroller reviews? So are we! All ten of these chairs are amazing buys, and we recommend each of them. However, there are two special ones you can check out if you’re in a hurry. The first one will be our Top Pick, which is the best of the group. The second will be our Budget Pick, which is a great stroller you can get without breaking the bank. Now, onto those reviews! The UPPAbaby G-LITE Stroller is the number one stroller for anyone who has somewhere to be! Your baby’s stroller has never been so portable. This shaded stroller is the best umbrella stroller for travel, hands-down. Why? It’s lightweight, weighing in at just under 11 pounds. That means almost anyone can pick it up! Also, it cleverly stands up when it is folded, making sure you can have both your hands free when you need them. It’s designed with comfort in mind too; the mesh sling seat is breathable, strong, and doesn’t add a bunch of weight either. The canopy is waterproof and is SPF 50+ as well. You’ll keep your baby protected and comfortable in this amazing stroller. And that isn’t even the best part! It’s also easy to clean. Every fabric part of the stroller is easy to detach, clean, and reattach. Simple and smart! The Disney Umbrella Stroller is the perfect little stroller for anyone who wants to bring baby everywhere by doesn’t want to lug around anything heavy. At just over eight pounds, this little guy is about as light as it gets. 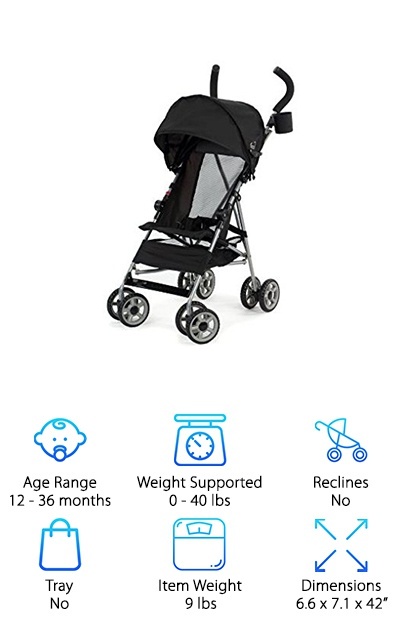 This stroller comes in three beautiful color schemes; there is a red Mickey Mouse one, a brown, pink, and light blue Winnie the Pooh version, and a colorful polka dot pattern that has no characters on it. 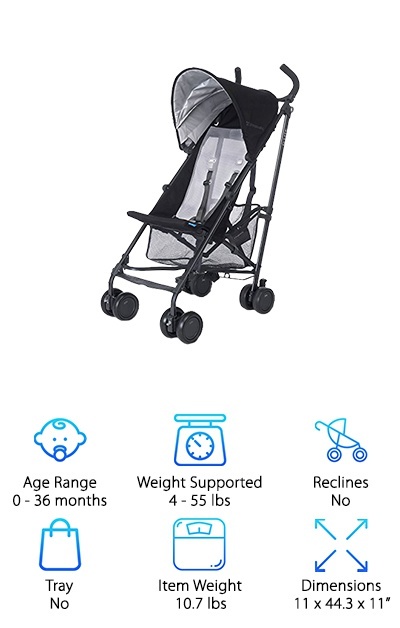 While it is not a tall umbrella stroller, it’s perfect for anyone looking for a backup stroller or a little travel number that doesn’t need a bunch of bells and whistles. And all this at a great price too! You really can get everything without breaking the bank with this stroller. Need a great umbrella stroller that reclines? 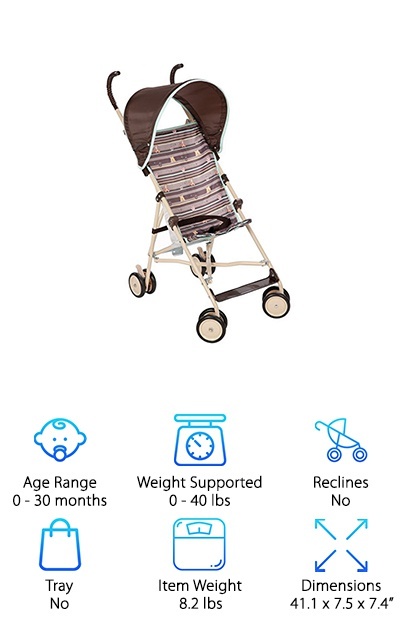 Then the Graco Click Connect Stroller is the right stroller for you! This amazing stroller makes getting where you need to go a breeze. The stroller folds up into an easy-to-carry bundle with just one hand. It folds tiny, so you can store it almost anywhere. The Graco Click Connect Stroller features a complete canopy for keeping rain and sun away from your little one. It accepts any Graco infant car seat too if you need the seat for your newborn or infant. So you can keep this stroller around from the first days of your new baby’s life all the way up to toddlerhood. You may never have to buy a new stroller ever again! Want a super lightweight stroller for your toddler? 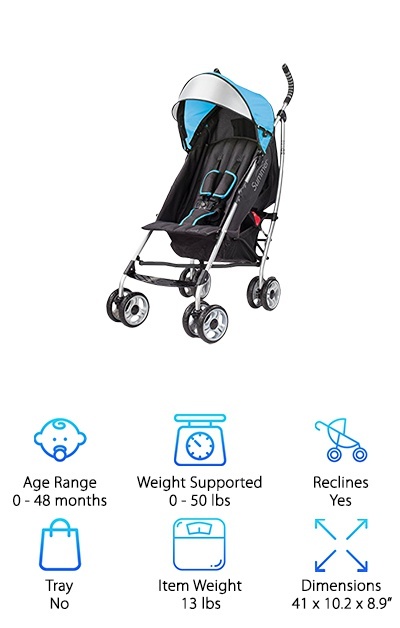 The Chicco C6 Stroller is an aluminum-framed, lightweight travel stroller that’s great for kids up to 2 years old. It folds to a small 10 by 8 by 45.5 inches, even with its roomier, bigger canopy that helps to protect your child from rain and sun. This has some great safety features too, including a five-point harness and front wheel locks to help keep your child safe. It comes with a carry bag to help you keep everything together. The reclining seat is padded to be as comfortable for your child as possible. But that isn’t even the best part! Our favorite part of this amazing stroller is actually in the wheels! If you want all-wheel suspension that’s great for going just about anywhere, the Chicco C6 Stroller has it! Need more than one seat? If you have twins or two children very close in age, the Kolcraft Side-by-Side Stroller is the perfect two-seater for you and your family. It folds down small and only weighs about 21 pounds, making this one of the lightest two-seat umbrella strollers we’ve ever seen. It’s heavy-duty and can support children in the 1- to 3-year range. 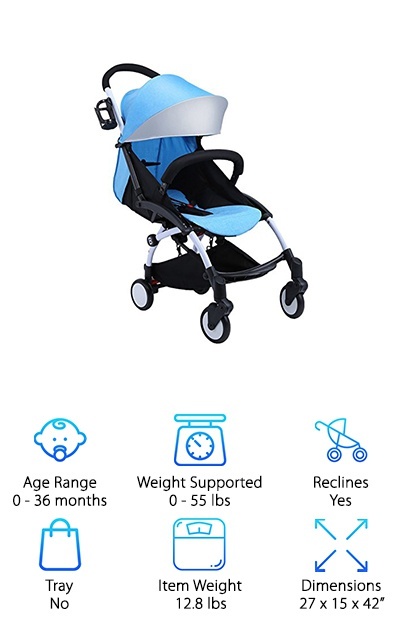 It features a cup holder for the parents, two, giant protective coverings for both sides of the stroller, and mesh backs for a breathable, comfortable ride for your kids. But that isn’t the best part! These amazing seats both recline separately for customized comfort for both of your kids. So if you are looking for a little something built for two, don’t overlook the Kolcraft Side-by-Side Stroller; it’s a real steal! Need a great umbrella stroller for tall parents? The Summer Infant Stroller, unlike most covered strollers, is built with even tall parents in mind. Imagine no more hunching over or push your baby around! It also has a ton of other great features, too. It travels well; it folds small, has a carrying strap, and weighs only 13 pounds. It also is very comfortable for your baby. The canopy shelters your little one from rain and sun while the breathable seat lays back to a flat napping position. Better still, this stroller has an extra-large storage compartment for all of baby’s things and maybe even some of yours! And the best part: this umbrella stroller comes in a big variety of color combinations, so you can pick your favorite. Want a stroller that folds down tiny? The Baby Trend Lightweight Stroller starts at 18 by 30 by 41 inches but folds down small enough to easily travel and carry. The five-point harness helps to keep your child secured while a large shade canopy keeps your kid safe from sunburn and rain. It also has a large storage basket to hold all of the stuff you need for baby, and it has two cup holders for the adults. The stroller grips are designed to be super comfortable. This amazing stroller even has an organizer tray up top for mom and dad. A dual-foot activated brake helps to make the Baby Trend Lightweight Stroller even safer! There’s little not to love on this awesome stroller. And it’s inexpensive too! The Kolcraft Travel Umbrella Stroller is one of the coolest strollers we’ve ever seen, both literally and figuratively! The back of the entire stroller is one, big breathable sheet of mesh, and the extra large canopy keeps the sun off of your little ones. At only 9 pounds, this stroller is super lightweight. The three-point safety harness keeps your child in place. And for your comfort, this stroller has padded handles and easy steering. And you get a storage basket and cup holders, too! This stroller is a little on the small side, so it is not designed for tall babies. However, if you are looking to get a good year or two out of an inexpensive, easy-to-carry stroller, the Kolcraft Travel Umbrella Stroller is a great choice! The Baabyoo Reclining Umbrella Stroller has a reclining position for everything! The five-point safety harness keeps your child in the seat as you move it from position to positions. There is a 95-degree position for sitting up and seeing the sights, as well as a nearly flat sleeping and one for breastfeeding. The breathable fabric wraps a hard back that is both comfortable and healthy for your baby. 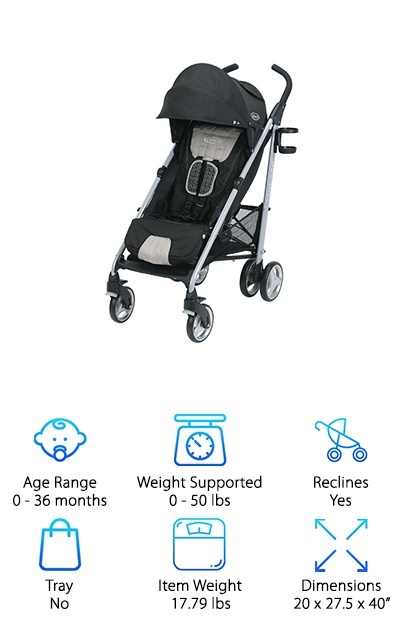 This stroller is lightweight, user-friendly, and high quality. From the shock-absorbing PU wheels all the way up to the Oxford cloth and aluminum frame, everything is made from quality materials that are safe and waterproof. So you’ll never have to worry about your umbrella stroller again. And, with an age range of 0 to 36 months, you’ll be able to keep this thing around for a long time! If you’re looking for an umbrella stroller with tray, the AmorosO Stroller with Tray was our fav. It’s super lightweight at 12 pounds and folds small for easy travel. It comes in four colors: purple, pink, gray, and red. The AmorosO Stroller with Tray is great for walking in stores, sidewalks, or other flat areas, but doesn’t have a suspension system for off roading. It has three reclining positions for your child’s comfort. There is also a pretty big basket for storing stuff for your child, as well as the all important snack tray. 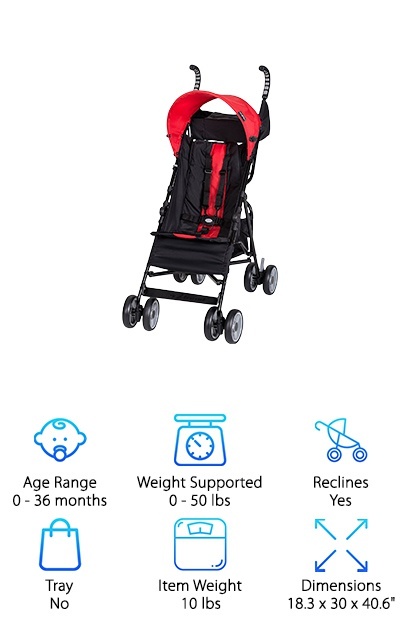 It supports up to 40 pounds, so this stroller will most likely be around with you and your child for a long time. Not to mention that this model is also very inexpensive. 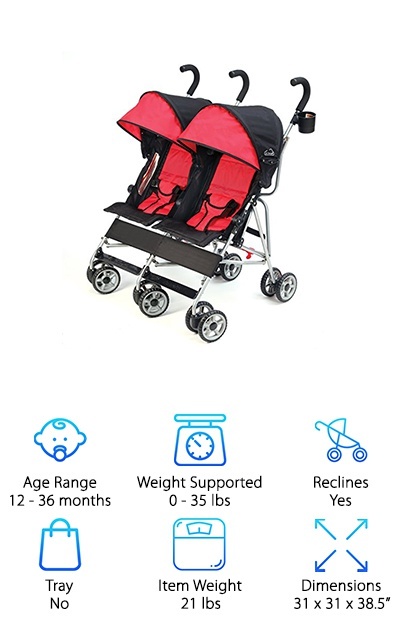 So if you need a great deal on an awesome stroller, take a look at the AmorosO Stroller with Tray. We’re pretty sure you’re going to like it as much as we do!